The ZiS-30 is a Rank II Russian tank destroyer with a battle rating of 2.7 (AB) and 2.3 (RB/SB). It was introduced during the Closed Beta Test for Ground Forces before Update 1.41. It is a lightly armoured tank destroyer mounting a gun that is very powerful for it's rank. 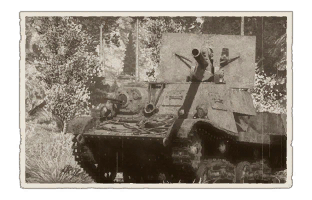 The ZiS-30 is the second Soviet tank destroyer on the Soviet tech tree. The highlight of this tank destroyer is its ridiculously powerful gun for its rank, which is capable of destroying most tanks of a similar rank in one shot. The ZIS-30 serves mainly in a support role, firing from the rear of the line at spotted targets. Despite this, the ZIS-30 can feasibly serve as a lone sniper or a hit-and-run vehicle, due to its powerful gun and impressive speed. Although the ZIS-30 is a powerhouse in terms of speed and firepower, it is quite fragile and can easily be taken out by enemy tanks. Due to the near nonexistent armour of the ZIS-30, the crew is extremely prone to damage and it takes very few shots to knock them out. A proven tactic is to fire at preoccupied enemies, so that they cannot react fast enough to fire back. Often it helps to set up an ambush position on a ridge and wait for the enemy to enter your line of fire. After taking several shots (2-4), it is advised that a new position be found, as other enemies may have noticed you by that time. The ZiS-30 possesses three main advantages – small dimensions, great speed and manoeuvrability, and a fantastic gun for its rank. With its good top speed and acceleration, it can move very quickly across the map. It is also comparatively a very small vehicle, so it can be a very hard target to hit especially at long range. Its gun has virtually no problems when penetrating anything on the given BR spread (eg. 2.3-3.3) and features a (relatively) fast rate of fire and flat trajectory, making the vehicle a suitable long range sniper. As the gun is mounted onto the roof, the vehicle has a reasonably tall profile. This is both an advantage and disadvantage – it compromises your cover which allows you to be spotted easier, but at the same time, you can shoot over lower obstacles while exposing only the gun shield. Obviously, there are disadvantages as well. The gun’s recoil is rather strong for the small chassis and the sway is large enough to cause you to lose track of your target, hence requiring realignment every time you take the shot. The vehicle also carries a very small ammunition supply. Most importantly however, the vehicle’s armour is practically nonexistent and even armour piercing rounds from rifle calibre machine guns can pierce your frontal armour at close range. The crew of the gun are protected only by the gun shield. Otherwise, it’s exposed and thus very vulnerable. However, many armour piercing rounds will just pass through the gun shield without detonating, significantly reducing the damage. That being said, it is advised to use HE rounds when facing the ZiS-30. Given its advantages and disadvantages, the ZiS-30’s performs best when used as a highly mobile, long range sniper. Race to a position using your speed and then conceal your fragile hull and then wait for the enemy to stumble in your sights. Use your high rate of fire to take several well aimed shots, then quickly relocate. Further research of the ZiS-30 will lead to the famous SU-76M self-propelled gun. 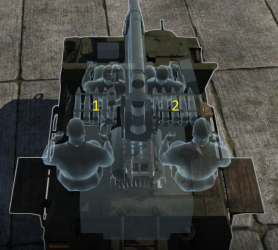 Aside from the front gun shield, there is no armoured encasement for the gunner and loader crew members. Ammo racks of the ZiS-30. As mentioned above, the ZIS-30 is ideal for ambush and sniping attacks, especially due to the fairly flat trajectory of the rounds. Carry a full load of ammo (it's only 20 rounds), especially the standard issue APHE shell, which is capable of penetrating the armor of just about every reasonable enemy for your BR. Shoot'n'scoot tactics are advised, and use the surprising agility of the vehicle to get into unexpected locations. While this tank can be used in AB to some effect (due to its excellent gun and good handling), you lose your main advantage, surprise! 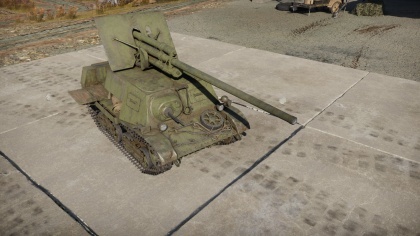 The ZIS-30 is easy to conceal due to its small size, especially if you have camouflage vegetation to add to the vehicle. This means that it is particularly effective in RB and SB. At the start of the match, rush to a good location overlooking enemy movement routes or a capture point and snipe away, making sure that you change your position every few shots to prevent enemies from tracking you down. In RB, planes become a big threat as the game goes on. Even light machine guns are a threat, and at BR 2.3 planes start getting heavier cannons and various payloads, which will tear you apart. Therefore, it is best to remain hidden in dense vegetation or among rocks or buildings to keep you safe. In SB the ZIS-30 is very good at protecting capture points from enemy vehicles. Simply find a good hiding spot and wait for your enemy to go to capture the point, then take them out one by one. Start as usual: Parts and FPE. The BR-271 is a good shell and the BR-271K upgrade can be ignored. Focus on all accuracy upgrades. Long range duels and shots are a favourite past time of all tank destroyers. Additionally it helps to hit the weak spots on enemy vehicles. After these, all performance upgrades like Engine or Suspension will come in handy to further improve the ZiS-30's excellent mobility. During the first weeks of Operation Barbarossa in 1941, the Soviet armoured forces suffered crushing losses at the hands of the well organised German army. As the number of Soviet armoured vehicles rapidly decreased, Soviet representatives searched for ways to compensate for the losses with easily produced vehicles. As a result, an order for the quick development of improvised self-propelled anti tank guns was issued in July 1941 as a means of providing the Red Army cheap and easy-to-produce anti-tank weapons. The schedule was extremely tight, allowing only two weeks for development. In response to this, the design bureau in No.92 Factory, led by P. F. Muravyev, developed a light anti-tank destroyer using the chassis of the Komsomolets tracked artillery tractor, propelled by a 4-cylinder GAZ-M automobile engine which produced 50 horsepower and top speeds of up to 47.5 km/h (29.5 mph). The process of refitting the vehicle was simple: the chassis and the hull remained unchanged, while the armament, the 57 mm ZiS-2 anti-tank gun, was simply mounted atop the vehicle. The crew consisted of four men, the commander/gunner, loader, driver and machine gunner manning the hull mounted machine gun. The situation was so dire, that mass production was launched on September 21, 1941 and by October 15, 100 vehicles designated as the ZiS-30 were produced, a mere three months after the order to develop the vehicle was given, making it perhaps one of the fastest designed vehicles in the world. The vehicle featured a gun that was capable of destroying any German tank of the period at combat range. This was a very welcome trait and proved invaluable to the Soviet defences against the German Panzers. However, there were significant disadvantages of its makeshift design. The weight of the gun reduced the mobility of the vehicle and the size of the vehicle allowed only a very small ammunition supply of 20 rounds to be carried. Protection of the crew was nonexistent, as the vehicle had only a very thin amount of armour and the gun crew was protected only frontally by the gun shield. The vehicle was unstable due to its high profile, had a low operational range and the communication between the driver and the gun crew was very problematic. Only 101 ZiS-30’s were manufactured due to problems with availability of both the gun and the chassis, both being urgently needed elsewhere. The ZiS-30 served until Summer 1942, being replaced by more specialised vehicles such as the SU-76M once the urgency for such vehicles disappeared. Skins and camouflages for the ZiS-30 series from live.warthunder.com.